Practice Master Pro is a practice management system for medical and healthcare practices. It contains customisable patient notes, patient invoicing and reports, automatic document generation and fully integrated email. Take a look at the main features below then look in more detail as you browse the rest of the site. We've put together lots of screenshots and videos to help you reach a decision, and when you're ready you can book a demo or sign up for a free trial. Managing a modern practice is a combination of high performance software on-site, online booking, 24/7 access via the cloud and integrated workflows to support different users of the system. Practice based systems give you high availability and a better desktop working environment. Cloud based systems give you 24/7 access to your data but lack professional features - and working in a website all day is simply not as good. Practice Master Pro combines the best of both. 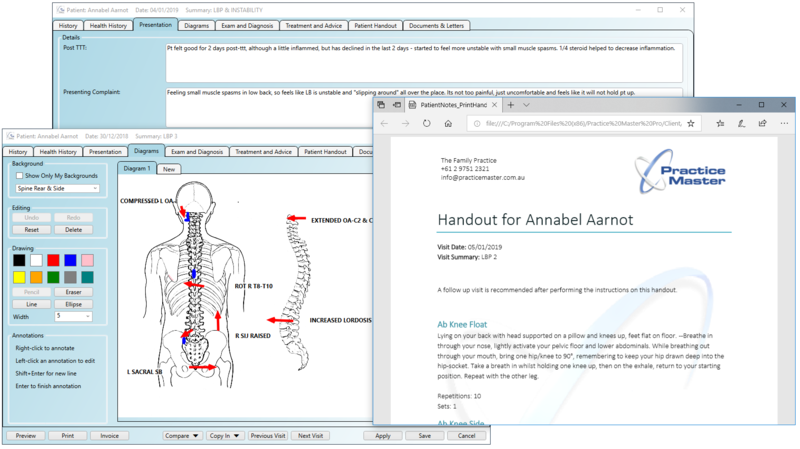 Taking patient notes has never been easier with our template based patient notes. You can create your own questionnaires as well as support multi-disciplinary practitioners all in the same system. 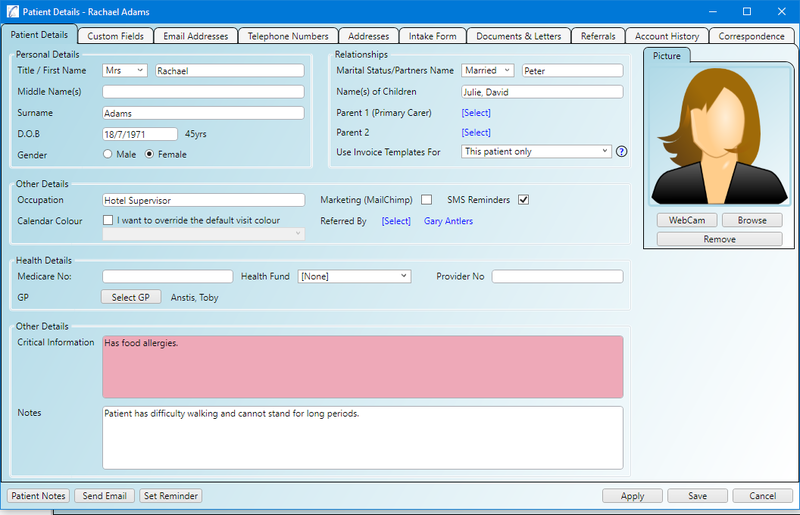 You can use our built in features like diagrams, patient handouts, prescriptions and the online intake form. Quick access to patient details is essential no matter where you are in the app or what you are doing. Shortcuts, links and summary panels make this easy. If you need access to their files, whether importing or exporting, you can do so easily as their documents & letters are integrated with the built-in email system. Communication is key in any healthcare practice. With integrated email at the core of the system you can view full correspondence for any patient or contact with a simple right-click. Automatic email matching means you can right click emails and open patient notes, book visits or view accounts right from the inbox or message itself. With accounts and invoicing built in you can generate invoices from your patients, patient notes or even by right clicking appointments on the calendar itself. Bill to the patient, a parent and even third parties. Everything is colour coded to help you find exactly where money is owing and you can email invoices straight to recipients with a simple right-click. 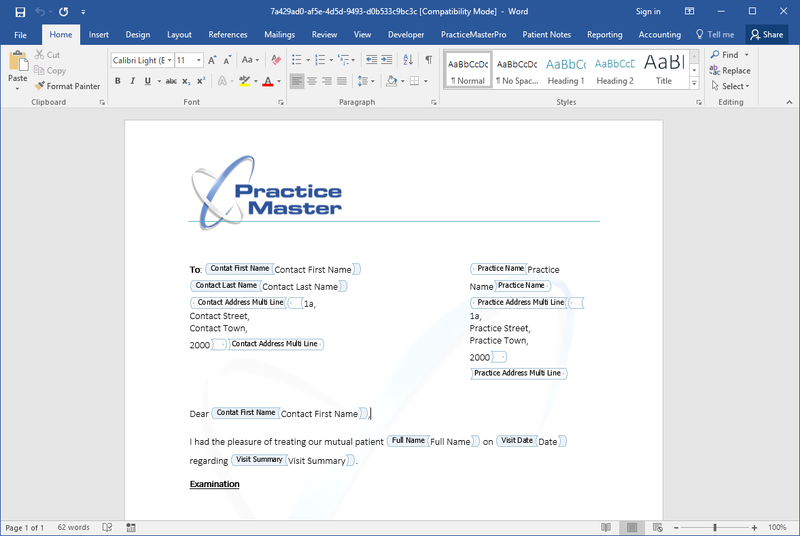 With templates created in Microsoft Word you can generate professional documents with a simple right click. You can import your existing documents and merge fields can automatically fill your documents with your patient's data. Full integration with the email system means it is easy to send or receive documents straight in to the patient's record. Practice Master has plenty of features out of the box to support you if you are a sole practitioner as well as a multi-disciplinary practice. Practitioners from any discipline can work side by side with each other using the same system. Some of the main modalities are listed here or click the button to learn more. Practice Master Pro has a "split" model when it comes to the cloud. We believe there are both pros and cons with both "cloud based" and "practice based" software so we have taken the best of both and merged them together. You get high performance desktop applications on-site which are not dependant on an internet connection combined with the convenience of 24hr cloud access via smartphone or iPad. 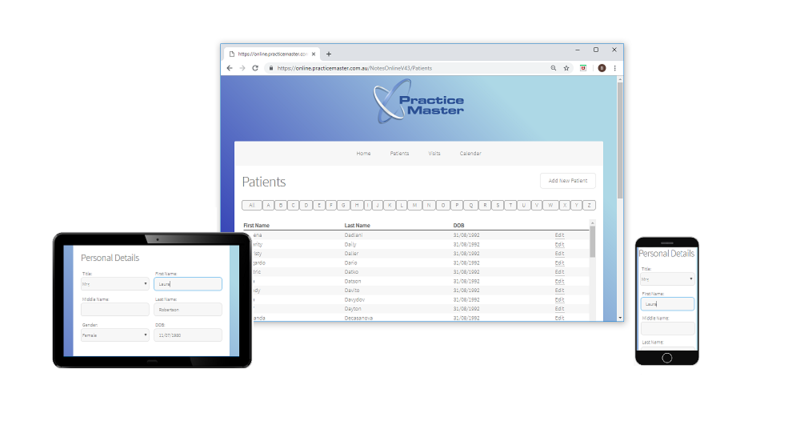 And because your data is at your practice you can rest assured you have full data ownership with Practice Master Pro. Workflow is the name of the game. One of the main advantages of a desktop application over a website are the workflow enhancements. For example, the ability to work in several parts of the application at the same time by leaving multiple windows open, making use of right-click shortcuts and by leveraging your existing Office software. Email is a primary communication channel with many patients and businesses and is built right in to Practice Master to help you get your work done faster. For example, emails in your inboxes can be automatically matched to patients to give you access to their notes, accounts, visit history etc all while reading their emails. You can also create fully templated emails with attachments and email invoices or documents straight to patients with just a right-click.